Also known as Tehuti or Thoth. Egyptian lunar god of Wisdom, consort of Maat, patron of science, mathematics, history and literature, and Nome-god of Hermopolis (Khemennu, near present-day Mallawi). He presided over the first month of the Egyptian year. The name Tahuti means “Ibis-god,” and he is depicted as a male deity with the head of an ibis. 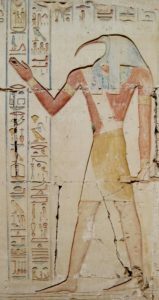 His costume varies: he may be depicted as crowned with either a simple black nemmes, a lunar disk, or the Atef Crown (the white crown of upper Egypt with two ostrich plumes), and he may bear the phoenix wand and Ankh or a tablet and pen. He corresponds to Nebo or Hermês in the Greek system, and is associated with Hermes Trismegistus in the Hermetic writings (see “Hermês,” below). According to legend, Thoth was the scribe of the gods, invented language, and was lord of all Magick. He was also the deity who weighed the heart of the deceased against the feather of Maat. He assumed the throne of Horus when Horus resigned earthly power. His sacred animals are the ibis and the ape, particularly the Hamadryas Baboon or Cynocephalus. Crowley considered him to be a human being, a Magus of A:. A:., whose Word was AMOUN, which means “hidden,” and refers to our True Natures. See the entry for Amoun, Chapter 72 of Liber Aleph and Chapter 7 of The Book of Lies.